TimeWolf Zephyr Employee Time Clock System for 50 Employees (Upgradeable to 100 Employees). Includes the Zephyr Badge Reader/PIN Entry Clock and 15-Proximity Badges. Optional Modules include a Multi-User License, Employee Scheduling and Job Costing. Add additional TimeWolf Badges - (15) Badges are included in kit. 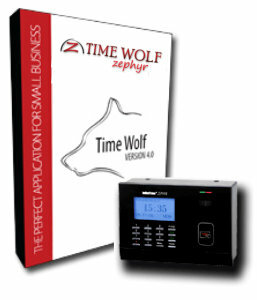 The Time Wolf Zephyr Employee Time Clock is an affordable time clock, bringing you the power of an automated Time Clock System at a very low price. The Zephyr, compact in design and easy to use, allows the employee to clock In and Out by using a Proximity Badge or via entry of a PIN Number at the keypad. The employee has the ability of viewing their last recorded punch time, transferring departments or even entering other information like tips, etc. The data collected by the Zephyr Terminal is then sent to the TimeWolf Employee Time Clock Software. TimeWolf puts you in control, detailed reports can be generated, exceptions tracked and corrected and then data can be passed on to payroll for check processing. For a Mobile Time Clock solution...Use the onboard USB Output Port to download punch data to a USB Flash Drive (you supply the flash drive) . Next, Copy and Post the punch data into the Time Wolf Software. Several practical and powerful Optional Software Modules are also offered, that yet again sets the TimeWolf Time Clock System apart from the rest!! TimeWolf Zephyr Time Clock...a complete Time Clock System Right Out of The Box. 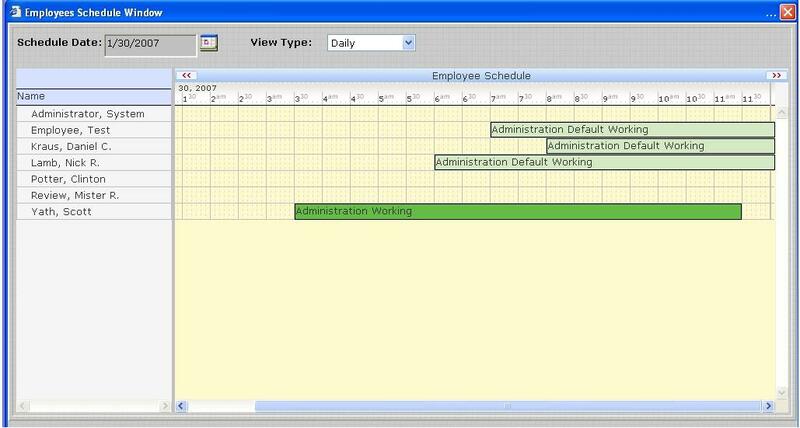 Attendance Points: A standard feature in the TimeWolf Time and Attendance software, attendance points allows you to assign a points value to each exception type, such as, Absent, Tardy, Early Departure, Long Break, etc. This creates a useful and impartial method to track employee abuses and alert managment as to when to apply loss of privileges or other disiplanary actions. The TimeWolf Zephyr Employee Time Clock Systems is ready for a variety of Data Collection Options...choose one method or a combination of each...all are included on this system!! Employees will Punch In/Out from the Zephyr Time Clock Terminal. The Punches are then polled by the Time Wolf Employee Time Clock Software. 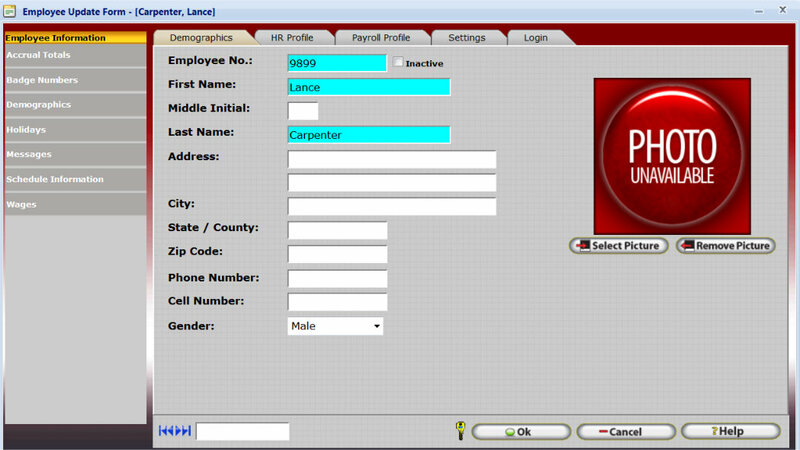 Employees can perform Department Transfers, View Last Punch, and View Accrual Totals all from the Zephyr Time Clock. The TimeWolf Employee Time Clock system is also offered with a Fingerprint Biometric Time Clock...click for information on the TimeWolf Juno Fingerprint Time Clock System. Real Time Clock Polling!! The System Clocks Monitor runs as a true Windows Service on the computer and can be set to poll and update / program the fingerprint time clocks in as little as 3 second intervals. 2) Workstation PC's require Internet Explorer, FireFox, Safari or Google Chrome web browser. 3) Windows 7 and Windows 8 limits concurrent "connections" to a maximum of 10 (includes devices on the peer network; IP Addresses, Other Workstations, Time Clock Terminals with TCP/IP Communications, etc)...this is not a limit of TimeWolf, but a limit imposed by the afore mentioned Windows operating systems. Are you looking for an effective way to keep your workplace running as smoothly as possible? Seeking an easier way to maintain your payroll practice? This TimeWolf time clock is exactly what your workplace needs! Small and efficient, this payroll time clock makes timekeeping a simple process. After all, you need to focus on your work. Leave the time keeping up to the TimeWolf time clock! Affordable and with the capability of handling up to 50 employees, this time clock is perfect for those smaller offices. Have more employees? Upgrading this device is easy, with the capability of maintaining timing and payroll details on up to 100 employees. This TimeWolf Zephyr time clock works in two ways: employees can clock in or out either with the use of a Proximity badge or by simply punching in a PIN code. This TimeWolf also features a unique TimeWolf Employee Time Clock Software, which allows you to generate detailed time reports which can be sent to payroll for quick check processing.